Ahhh, the virtue-signalling champagne socialists. Can’t help themselves, especially when it comes to “Saving The Planet”! Looks like the NZ people had it too good under conservatism. Strange how people become tired of boring – growth, freedom and prosperity delivered to their front doors by conservative governments. Is the new Leftist NZ PM so isolated as not to read of the disastrous consequences of going down the unreliable-energy, wind/solar path. Energiewende has destroyed Germany’s industrial heartland and is near implosion. And South Australia – blackout capital of the world with officially THE highest power prices in the world thanks to their mad obsession with renewables. Early this month, New Zealand’s Labour Party took power thanks to a power-sharing agreement Labour and Green parties with the nationalist, populist New Zealand First party. Aside from being the country’s youngest Prime Minister in almost 200 years, Jacinda Arden is already outlining plans to commit civilizational suicide by joining with countries such as France, Great Britain, Germany and India in their quest to end use fossil fuels. A DOSE of global energy reality that should act as a shot in the arm for climate obsessed politicians who have recklessly bowed down to the green religion. Australian elected representatives, from both sides of the aisle, morally swooned into symbolic, unreliable and ‘unelected‘ green-energy sources that have destroyed Australia’s competitive advantage with power prices, now officially, the highest in the world. MEANWHILE, the rest of the energy-sane world saves their virtuous eco-speak for Paris gabfests and moves forward with cheap, efficient and reliable energy sources that underpin economic strength and job security. Nations around the world are building coal-fired power plants at a faster rate than those being ­decommissioned. The plants under construction reflect a 10 per cent increase to the total global generation powered by coal. New electricity generated by coal-fired plants will outstrip that which was retired in 2015 and 2016 by a factor of five. With Australia facing a policy crisis over energy security and the winding back of reliance on coal, construction of new coal-fired power plants was increasing in at least 35 countries, according to data analysis supplied to the ­Nationals by the federal parliamentary library. China has 299 new coal generation units under construction, followed by India which is building 132. Australia’s closest neighbour, Indo­nesia, was planning a further 32. Nuclear countries, including Japan and South Africa, were also increasing their exposure to coal-powered investment, with 21 new plants between them. Vietnam was building 34. The data was requested by ­Nationals senator and party whip John Williams, who has argued that the carbon emissions produced by the new plants worldwide would eclipse Australia’s total carbon emission profile. “We don’t have a tent over Australia … emissions are going up around the world because of these generators being built,” ­Senator Williams told The Australian. “We are bowing down to the green agenda which will make no difference to the world’s ­emissions. The parliamentary library paper showed that 321 gigawatts of new generation would come from coal plants under construction globally. In 2015 and 2016, total coal generation retired amounted to 64 gigawatts. Worldwide, the paper showed, there were currently 5973 units of coal-fired power generation. There are often multiple power-generating units within a power station. The number of new units under construction totalled 621. It would take until 2057 for Australia’s 16 remaining coal-fired power stations to reach the end of their working life, with four slated to shut in the next decade. Labor and the Coalition have allowed the politics of ­climate change to distort sensible energy policy. The only difference between the two major parties is one of degree, with Labor pushing a higher renewable energy target than the Coalition. In both cases, the climate tail is wagging the energy dog, with RETs and subsidies rendering investment in coal unviable, leading to gaps in baseload power, grid instability, blackouts and that insufferably high power bill on your kitchen bench. If renewables made economic sense without subsidies, the industry would thrive without an RET and without driving up energy ­prices. It’s hard to imagine a policy more certain to kill jobs and industry and drive investment offshore. Ben Pile identifies the all too simplistic view of the climate debate by Government science advisors. Where the use of scientific ‘authority’ to influence policy, results in the failure of advisors to shed any light on the debate. …twenty-first-century science is not recruited to find solutions to material problems. It is appointed to lend its authority to politics. The preferred solutions to the problem of climate change have been top-down target-driven policies, rather than technological or economic ones. Scientists have consequently been forced to frame their own contributions to the debate in the preferred, urgent terms that underpin radical policy interventions. Sir Mark Walport’s demand that climate-change sceptics ‘grow up’ only reveals his ignorance about the climate debate. According to an article in The Times (London) earlier this week, the government’s chief scientific adviser, Sir Mark Walport, is about to start a lecture tour, which ‘will put climate change back on the political agenda’. With the global effort to reduce CO2 emissions in tatters, with the EU doing a volte-face on its own green energy targets, with the UK examining its own commitment to the Intergovernmental Panel on Climate Change (IPCC) and to green legislation, and with scientists scratching their heads about the absence of warming over the past 17 years, Walport’s words seem incautious, possibly foolish. Environmentalists have a tendency to do their own negative PR. Too much was invested by too many in the notion that, by now, we would be seeing the natural world fall apart, taking human civilisation with it. It didn’t happen. Environmentalists’ prophecies about the climate have gone the way of their prophecies about population, resource depletion, and toxic chemicals. The IPCC – the embodiment of the consensus itself – recently reported that there is no climate change signal in extreme weather events, except a slight tendency toward warmer days and increased precipitation. Nature, it seems, abhors vacuous alarmists. Worse, environmentalists have failed to reflect on their own failures, and to find some other way of accounting for them. Accordingly, Walport’s opening salvo in this new climate offensive were ‘There are some people who don’t like the policy implications of climate change and think that the best way to duck the discussion is to deny the science’. The government’s soothsayer points his expert finger. Walport is wrong. There have been countless criticisms of UK, EU, and UN climate and energy policies, quite apart from the criticisms of mainstream climate science, from climate sceptics. Climate sceptics have long been critical of the UK government’s hastily-constructed attempts to save the planet. And sceptics have observed that green-energy policies are expensive, don’t provide adequate or reliable supply, and have created deep distortions in the energy market – problems which are now being felt across Europe. Furthermore, sceptics have argued that emission-reduction targets were never tested for feasibility, much less for costs and benefits, and even less for their effectiveness at saving the planet. There is even a think-tank established precisely to interrogate climate policy – the Global Warming Policy Foundation (GWPF). The clue is in the name. The GWPF has published reports on EU policy, shale gas, alarmism in policymaking, green jobs, problems with the IPCC, the Stern Review, and many other topics. If Walport had read just one of them, he would surely address them. 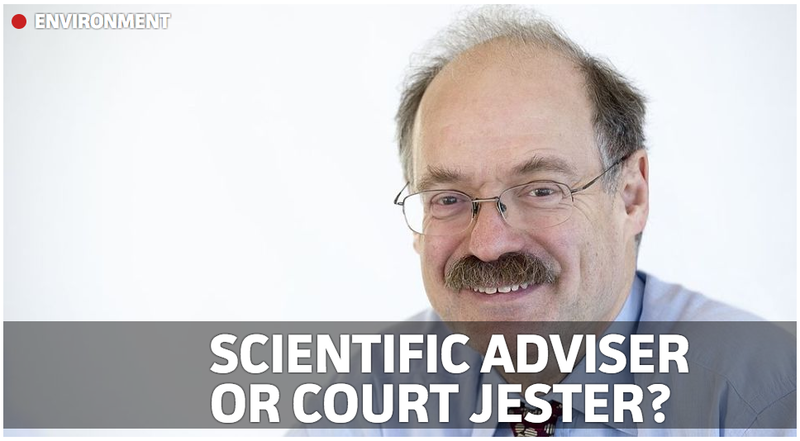 Walport joins his predecessors, such as David King and John Beddington, and past and present presidents of the Royal Society in taking a simplistic view of the climate debate. But the problem with such naked attempts to use scientific authority to influence policy is that these men soon reveal their lack of expertise and understanding. They are forced by their own ignorance to reinvent the debate, and in the process miss its substance, arguing instead with the cartoonish image of sceptics that exists only in their heads. The result is that these advisers fail to shed any light on the debate they are appointed to inform. “science and technology improvements will allow us to take action moving forward that meets the needs of this president as he has charged EPA” …. McCarthy said. Climatism comment : The UN’s un-mandated power and influence at the local Government level through ICLEI (aka Agenda 21) is at best highly deceptive, at worst extremely dangerous to societal freedoms. More need to be aware of their vastly overreaching ‘sustainability’ agenda and overall globalist intentions. In Part One we tried to understand why useless and destructive industrial wind turbines continue to be forced on unwilling communities in rural Ontario. The Government of Ontario seems to be in the grip of powerful unelected, unaccountable interests that makes it care little for the democratic process, the welfare of the people or the health of the economy. Deep within human nature there are certain types of people who yearn for catastrophe, they yearn to have significance in their lives believing that theirs is the time when the chickens are coming home to roost and everything is going to go belly up. We don’t have to go too far back in time to witness man’s fear and fascination with climate fluctuations, natural or man-made. The Global Cooling and “New Ice-Age” scare of the late 1970’s promised mankind ‘political upheaval, social unrest, major economic damage and global food shortages.’ However given lots of money and “urgent” action from the top, clever man was able to miraculously avert such global catastrophe. Fast forward only 35 years and the dire warnings and economic scenarios we read about in today’s current Global Warming ‘crisis’ are straight out of the 1970’s Global Cooling playbook; simply swap cooling for warming and voilà ~ another “man-made” global catastrophe to match the temperature of the day. And another excuse for Government’s to steal your hard-earned money and play weather-god’s to fix a perceived ‘climate crisis’. The United Nations’ IPCC now aims to prove human CO² is causing global warming as part of their belief that industrialised populations will exhaust all resources and must be shut down. • Short memories we have. The recommended U.S. Climate Program will require $39.8M of new funding in FY 76, with further increases of $7.3M in 77and $9.4 in FY 78. Because the impacts of climate fluctuations are felt directly or indirectly by all nations, and because the processes that control climate and the systems to monitor them are global in scope, international efforts will be needed. The United States should foster them in all appropriate forms. It is clear that climate fluctuations are resulting in major economic, social and political consequences. Our vulnerability has a increased; as the world’s population and the affluence of part of it have grown, grain reserves have shrunk to the point …. These concerns are compounded by mounting evidence that man’s industrial and agricultural activities may cause changes in climate inadvertently…. Scoundrels at NOAA and NASA have been working tirelessly to rewrite the history of the period, but sadly for them, the Internet never forgets. 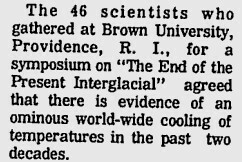 Most of us will be aware of the stories about the “ice age scare” during the 1970’s. Many have dismissed these as little more than journalistic hype, but some facts are incontrovertible. Many severe weather events were linked to this cooling. The US Government was concerned enough about this climatic change that, in 1974, it set up a Subcommittee on Climate Change, under the auspices of the Secretary of the Interior.The Committee was to be chaired by Robert White, Administrator of NOAA, and made up of representatives from various Federal agencies and offices.